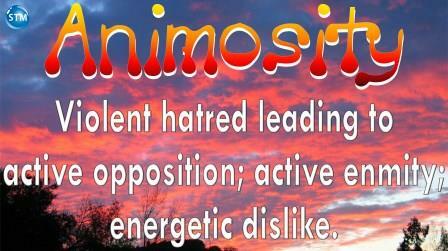 Animosity – Violent hatred leading to active opposition; active enmity; energetic dislike. Genesis 3:14-15 (TLV) Adonai Elohim said to the serpent, “Because you did this, Cursed are you above all the livestock and above every animal of the field. On your belly will you go, and dust will you eat all the days of your life. I will put animosity between you and the woman— between your seed and her seed. He will crush your head, and you will crush his heel. The word ‘animosity’ is not part of my vocabulary, but while working on a paper ‘Faults, Sins and Abominations’, I found it merits attention. It is not used in any of the King James versions, I did find two Jewish translations that use the word ‘animosity’ in Genesis 3:15; the paraphrased Complete Jewish Bible (CJB) and Tree of Life Bible (TLV). Later we will give definitions of animosity, but I wanted to alert the children of God; animosity is not a quality that is acceptable or pleasing to God. I know we are not perfect, but we should be working to rid our lives of things that do not please God [read Romans 8:1-11 (focus verses: 5-8) and 1 Thessalonians 4:1-12 (focus verses: 1 and 3-8)]. Let’s compare three words that grow and develop out of hatred; enmity, animosity and malice. Animosity is active and open or publicly declared and is considered more serious and extreme than enmity which is often hidden or secret. Malice is intentional desire to hurt another or delighting in harming or hurting others. Hatred – Great dislike or aversion; hate; enmity. Hatred is an aversion to evil, and may spring from utter disapprobation, as the hatred of vice or meanness; or it may spring from offenses or injuries done by fellow men, or from envy or jealousy, in which case it is usually accompanied with malevolence or malignity. Extreme hatred is abhorrence or detestation. Enmity – The quality of being an enemy; the opposite of friendship; ill will; hatred; unfriendly dispositions; malevolence. It expresses more than aversion and less than malice,and differs from displeasure in denoting a fixed or rooted hatred, whereas displeasure is more transient. Malice – Extreme enmity of heart, or malevolence; a disposition to injure others without cause, from mere personal gratification or from a spirit of revenge; unprovoked malignity or spite. Animosity differs from enmity which may be secret and inactive; and it expresses a less criminal passion than malice. Animosity seeks to gain a cause or destroy an enemy or rival, from hatred or private interest; malice seeks revenge for the sake of giving pain. Psalm 25:19-21 English Standard Version (ESV) Consider how many are my foes, and with what violent hatred they hate me. 20 Oh, guard my soul, and deliver me! Let me not be put to shame, for I take refuge in you. 21 May integrity and uprightness preserve me, for I wait for you. An excerpt from Barnes’ Notes on Psalms 25:19 “And they hate me with cruel hatred – Margin, as in Hebrew: “hatred of violence.” It was such hatred as tended to violence; such that they could not restrain it. It sought his destruction, and was ready to break out at any moment. 1 Corinthians 5:6-8 The Peschito Syriac NT (PSNT) MY brethren, your boasting is not seemly. Know you not that a little leaven the whole mass leaveneth? 7 Purge from you the old leaven, that you may be a new mass; so that you may be (as) unleavened bread. For our Pascha is the Meshiha, who hath been slain for us. 8 Therefore, let us perform the festival, not with the old leaven, nor with the leaven of wickedness and animosity, but with the unleavened bread of purity and of holiness. To make this crystal clear, animosity is defined as violent or intense hatred; Galatians 5:20 lists hatred as a sin—work of the flesh—those guilty of such will not inherit the kingdom of God. I cannot speak for you, but I hope we can agree, if animosity is a more intense and active form of hatred, I do not want it to become a part of me. Get rid of hatred / enmity before it grows into animosity; maybe the Scriptures can help us understand why we need to eliminate it. The Revised King James NT revision of Romans 8:7 tells us that “the mind set on the flesh is hostile to God”; the KJV “the carnal mind is enmity against God”. Galatians 5:19-21 Revised King James NT (RKJNT) Now the works of the flesh are obvious; they are; sexual immorality, impurity, licentiousness, 20 Idolatry, witchcraft, hatred1, strife, jealousy, fits of rage, selfishness, dissensions, factions, 21 Envy, drunkenness, orgies, and the like: of which I forewarn you, as I have also warned you in the past, that those who do such things shall not inherit the kingdom of God. 1 the Amplified Bible, English Standard Version and Revised Standard Version amongst others replace hatred with enmity. The word ‘hatred’ is used only once in the KJV New Testament, but according to the Englishman’s Concordance, the Greek word ἔχθρα echthra is also used as ‘enmity’ in Luke 23:12, Romans 8:7, Ephesians 2:15 and 16 and James 4:4. I mentioned the absence of animosity in the various King James revisions; the following are a few Scriptures in other translations where animosity replaced, war, hated and hatred. Hosea 9:7-8 (NET) “The time of judgment is about to arrive! The time of retribution is imminent! Let Israel know! The prophet is considered a fool— the inspired man is viewed as a madman— because of the multitude of your sins and your intense animosity. 8 The prophet is a watchman over Ephraim on behalf of God, yet traps are laid for him along all of his paths; animosity rages against him in the land of his God.” – Replaces hatred in both verses in KJV; H4895 מַשׂטֵּמָה mastemah (mas-tay-maw’) n-f. 1. enmity; animosity. Complete Word Study Dictionary OT – A feminine noun describing hostility, hatred. In context it indicates an attitude and state of animosity and rejection, especially toward God’s prophets and spokesmen (Hos. 9:7, 8). Colossians 3:8-11 1770 John Worsley NT (Worsley) But now put away all these also, wrath, animosity, malice, calumny, and filthy discourse out of your mouth. 9 Lie not one to another, seeing ye have put off the old man with his evil practices; 10 and have put on the new man, which is renewed in knowledge, after the image of Him that created him. 11 Wherein there is neither Greek nor Jew, circumcision nor uncircumcision, barbarian, Scythian, slave, or free: but Christ is all and in all. That is all for now my dear friends, animosity may not exist in your version of the Bible; many horribly sinful acts are not listed in the Bible e.g., genocide or serial killer, but do not think they are okay. Any violent action resulting from or carried out in hatred cannot reflect a Christian attitude or character. At some point in the near future, I plan to expand on hate and hatred in a Bible study; until then, please continue to allow the Scriptures and Spirit of God guide you—be blessed, Tim. Hate is often a precursor to violence. Before a war, a populace is sometimes trained via political propaganda to hate some nation or political regime. Hatred remains a major motive behind armed conflicts such as war and terrorism. Hate is not necessarily logical and it can be counterproductive and self-perpetuating. 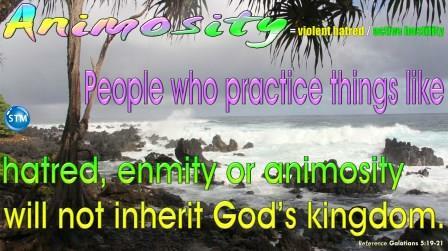 ♥ Question for “animosity”: Are you holding animosity or strong hatred for or toward someone? There’s definately a lot to learn about this issue. I like all the points you have made. This site is something that is required on the internet, someone with some originality. Thank you for being a blessing, your support encourages us to continue this work of love, blessings to you and your husband! I just got your email. Thank you and god bless u as well. I am going to start this today. I really need this. Thank you so much. Just cant do it till i get off work. But will start as soon as i get gome to share with my husband.